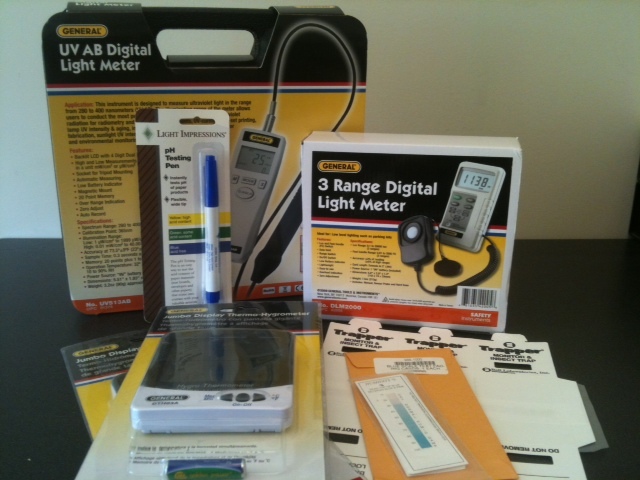 Museum members may rent our Environmental Monitoring Kit. It contains simple, user-friendly instruments and materials that are sturdy and easy to use as well as instructions and items to keep. Sites can get data immediately without a computer hookup, calibration, or downloading of data. The equipment can monitor results in different exhibit spaces, storage areas, and any location where collections are housed. Sites may elect to rent the Kit more than once to compare data and establish a baseline picture of conditions at their collecting institution throughout the year, seasonally, or in a particular area of their facility. Rental fee is only $40 and covers shipping of the kit to the collecting institution and back to VAM. A deposit is required to cover the cost of replacing the equipment. For questions or to coordinate rental, please contact 804.358.3173 or cnewton@vamueums.org.